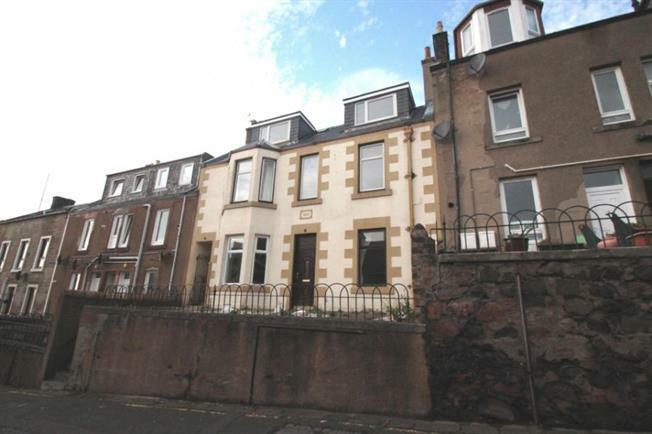 3 Bedroom Upper Floor Maisonette For Sale in Leven for Offers Over £68,500. This impressive traditional upper maisonette apartment is located within Buckhaven, close to the waterfront yet within reach of local amenities. With private access door, the generous sized accommodation on two levels affords stunning views over the Firth of Forth and benefits from double glazing and gas central heating and should therefore appeal to a variety of potential purchasers. Access is gained via shared steps to a private entrance door to the rear of the property into the entrance vestibule. A further door gives access to the hallway with stairs and window to the front. The spacious lounge is a well proportioned reception room with both front and rear facing double glazed windows, alcove shelves for storage and feature fireplace. The dining room/bedroom 3 has a front facing double glazed bay window with views over rooftops to the Firth of Forth and is enhanced further with an attractive cast iron fireplace and cornicing. The modern galley style kitchen has two rear aspect double glazed windows and is fitted with a range of base and wall mounted storage units with integrated oven, gas hob and hood and space for two further appliances. On the upper floor, bedroom one is an attractive double bedroom with both front and rear facing double glazed windows and a walk-in storage cupboard. Bedroom two is also a double bedroom again with front and rear facing double glazed windows and storage cupboards - both bedrooms benefit from the stunning views over the forth. The bathroom has a rear aspect double glazed window and is fitted with a three piece suite comprising WC, pedestal wash hand basin and bath with electric shower over. Externally, there is a private garden to the rear which has been paved and terraced and offers generous outdoor entertaining space.